My first contact with Gremlins was not watching the movie at a theater, but reading the novelization that came out a few weeks before local theaters got to exhibit the film. As a result, I could not help feeling a little disappointed by the imagery in the movie when it fell short of what I had envisioned in my head. But then came out the sequel, Gremlins 2: the New Batch, and by the time I was much conscious about avoiding spoilers, and as a result I enjoyed the film much more. One of the more clever aspects of the second movie is that we got to see a wider variety of the creatures, which is something that NECA surely had in mind when they acquired the license to produce action figures based off these movies. 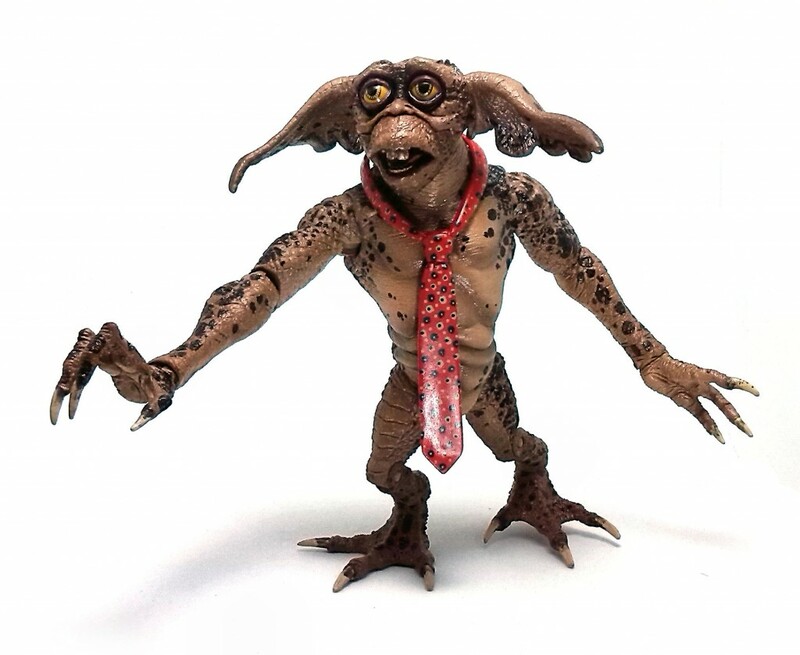 The first gremlin I got is Lenny, who appears in the second movie and seems to be what one would call a “special” type of Gremlin. 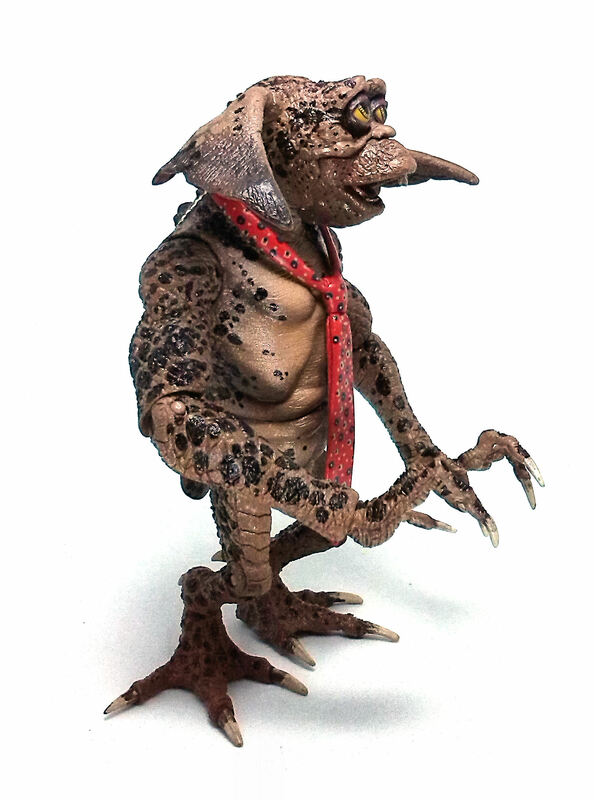 The creature’s appearance is loosely based on Lennie Small, a character from John Steinbeck’s novel “Of Mice and Men” although, gremlins being what they are, he may not be as harmless as his appearance suggests. 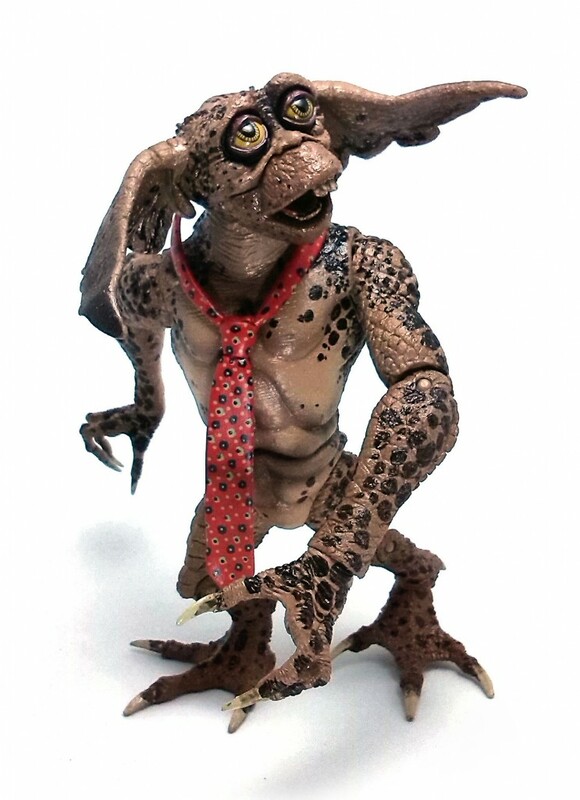 NECA did a completely new sculpture for this character, as Lenny is larger and wider than regular Gremlins. 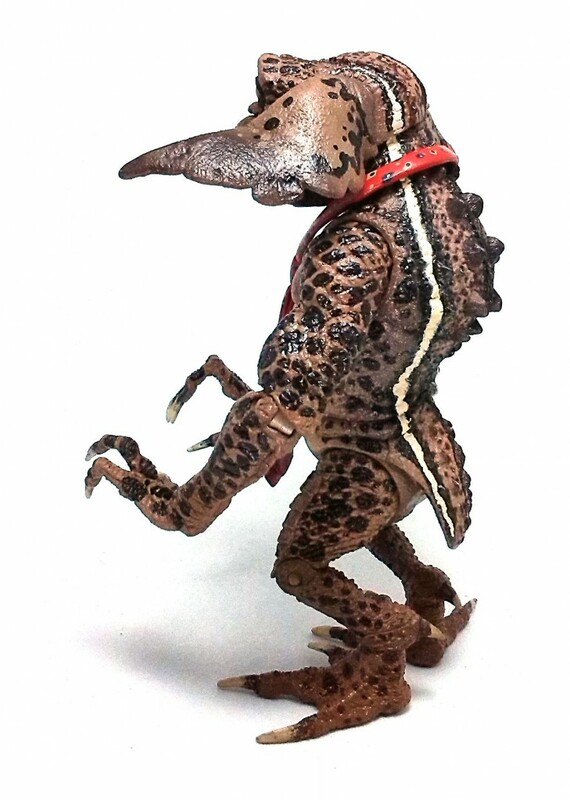 The body proportions are accurate for this species, and the entire body displays sculpted textures that go from rough hide to scales at the back. The head sculpt is really gorgeous, from the slack jawed grimace to the gently sagging ears. The big, sad eyes help Lenny to convey a puzzled, almost gentle expression that contrasts with the stocky, muscular physique of the creature. All these barbells and actual ball joints in Lenny work great for concealing the articulation but they also limit somewhat the range of movement they have. Lenny still gets anough posing options as it is, with the added benefit of improved stability thanks to the stiffer joints. As good as the sculpture is, the paintjob is even better. 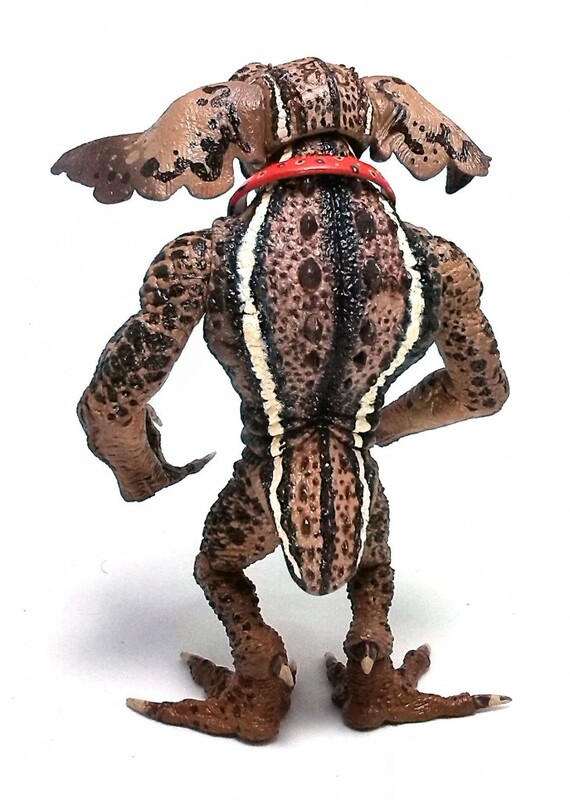 Granted, the painting techniques used on the body are not particularly complex, as the organic nature of the deco is particularly forgiving to paint spills and mild sloppiness, but the subtle gradients on the torso and the markings on his back look quite realistic. The best part of the paintjob can be found on the head, specifically Lenny’s eyes. These have a yellow tint around the pupils and are given a coat of glossy varnish that simulates the moisture in the eyes. The inside of the mouth and teeth are also painted in a rather filthy fashion, giving Lenny a slightly diseased appearance. Lenny comes with no accessories whatsoever, except maybe the tie hanging loosely from his neck, which is not removable unless you take out his head. the tie is painted red, and has a rather nice three-color floral pattern painted on. 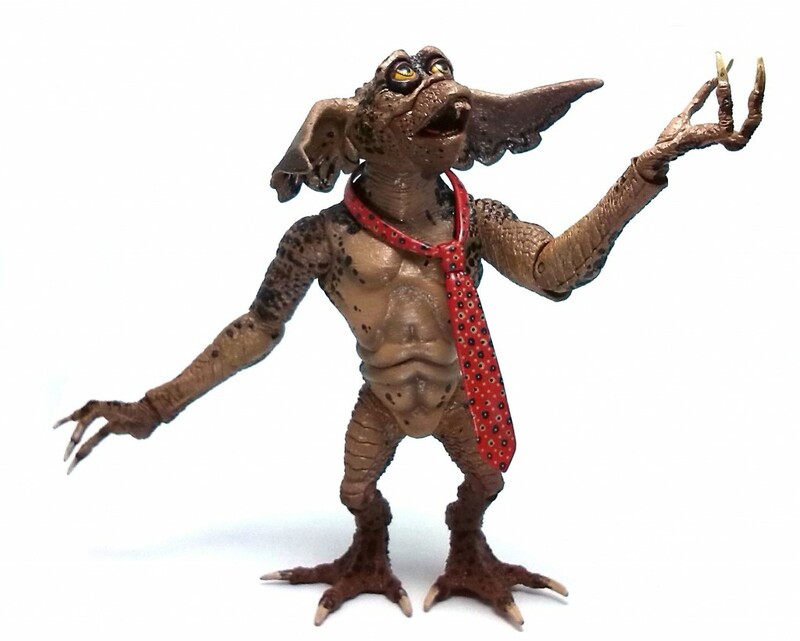 To be honest, I would not have picked out Lenny as my first gremlin. 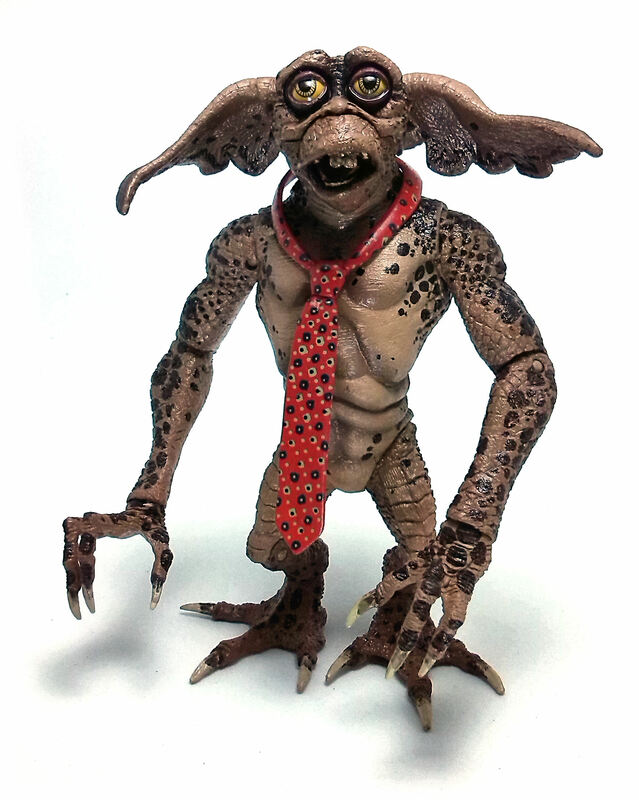 I tend to favor the more generic looking creatures first when I begin a new collection, be it an alien Xenomorph, a Gremlin or a Predator, but Lenny was heavily discounted, making him a very viable entry point for me into NECA Gremlins. The fact that he turned out to be such a great action figure further validates my commitment to this line.